Designed for forgiveness, distance, and feel, the brand new Mizuno JPX-800 PRO has the highest COR ever developed in a legendary Mizuno one piece Grain Flow Forged iron. A sizeable cavity is created using a CNC cavity milling process which thins the face to raise ball speeds for extreme distance, and improves a low, deep center of gravity for increased forgiveness on less than perfect shots. These clubs provide an impeccably tuned sound at impact for the ultimate in feel. The JPX-800 PRO is also extremely pleasing to the eye, with a traditional look at address, minimal progressive off-set, thinner top line, and a modest, workable head size. In addition, the sole of the JPX-800 PRO has an aggressive Triple Cut design that allows for solid ball striking from all types of lies on the golf course. 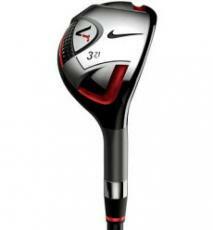 The Nike Victory Red Hybrid is the newest addition to Nike Golf’s Victory Red lineup of clubs. The outcome is a Tour-inspired quality hybrid golf club that is appropriate for use by the better players. The Victory Red Hybrids are intended to offer beauty and sophistication while offering excellent performance that the Victory Red range has become recognized for. In the hybrid club this includes a Tour motivated design that offers great workability and distance thanks to a slightly open face and a repositioned center of gravity. Take a look through some great deals on new and used Nike VR Tour Hybrids.